Designed for the grass-roots, by the grass-roots! 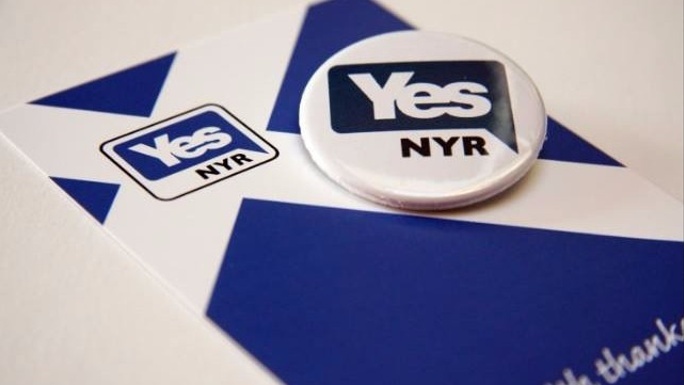 We are a non party-political communications platform for the whole Yes movement. Where ideas, equipment, campaign strategies and social events can be easily co-ordinated and shared across the entire Indygroup network. Locally, regionally and nationally. We currently have 107 participating groups on the IndyApp platform and that number is steadily growing all the time. Our task now is to complete the platform and provide each of the groups with their own Local forum for discussion, planning and self-organisation. It is this 'Local Forum' system that will allow the groups to network with one another as independent members of the 'National Forum'. The blue edit button removes Chuffed.org's voluntary fee. Only the transaction costs are added to your donation. NYR will pay Chuffed a % from our final total. IndyApp completion is now Urgent! Snap election or not, Holyrood has already declared a new Independence Referendum will happen 18-24 months from today. This is our complete focus! So, it is now a matter of urgency that the entire IndyApp 'National Forum' structure is fully completed, working and downloadable as quickly as possible. We propose achieving this within 3 months of our crowdfund ending successfully (4 months from today). It is also our intention to hold a National Convention of all participating indygroups, approx. five months from today. Under our current rate of growth we could easily be 150+ groups on the day (plus general public), making this a fantastic face to face grass-root networking opportunity, aswell as a great publicity centrepiece to collectively launch ourselves from. This very public collective 'statement of intent' will mark Scotland out as the most technically advanced grass-root campaigning nation in the world! Alongside these App delivery date changes, we are also in the process of evolving and changing as an organisation ourselves. From what was a small, ideas based design and production team, into what is already becoming a national organisation of 107 autonomously networked community groups (and growing). This dramatic transformation obviously requires a ‘step change’ in both organisational and funding arrangements. The good news is, we have already planned for these changes and developed an IndyApp funding strategy based around mass participation and voluntary micro donations. For this strategy to succeed however, we need to get from where we are today to where that new mass participation model can begin to kick in. This crowdfund appeal (and its accompanying cost breakdowns) are simply our best estimates of the minimum required to reach that sustainable, self funding stage. How we encourage new group formation! As each user downloads the IndyApp, they register using the first half of their postcode. This allows us to locate each download within a general postcode area, while still ensuring all user addresses remain completely anonymous. How to communicate directly with all yessers! Combining our new user distribution capabilities with the IndyApp’s private messaging function allows us and our participating groups the ability to keep in regular contact with all those pro-Indy supporters that download the IndyApp but that are not yet a member of a local group or involved in the campaign. This makes it possible now to target yes supporters that have downloaded the IndyApp with very specific local campaign messaging. An amazing grass-root advance on IndyRef1! These new capabilities will obviously increase local reach and community campaigning power of the Independence movement. It will help us encourage early participation in campaigning from all those new supporters that want to help but don't know how. Especially during the heat and organised chaos of the closing stages of IndyRef 'New'! Specification for completion within 4 months. FUNCTION: A place where local groups can post campaign ideas, proposals and practical experiences they feel will be of interest and benefit to their fellow groups. FUNCTION: Allow Group Editors and National Admins easy access to all the integrated app functions already described. FUNCTION: To extend secure user access to IndyApp functions on the Internet to match those currently available via mobile devices. Including secure login capabilities across all platforms. FUNCTION: This will be the publicity centrepiece to kick us all off as a fully functioning national grass-root community group network. Great quality button badge that will look great on wherever you pin it to! Lovely nickel (silverish ;-), white and blue enamelled NYR Yes badge. Wow! 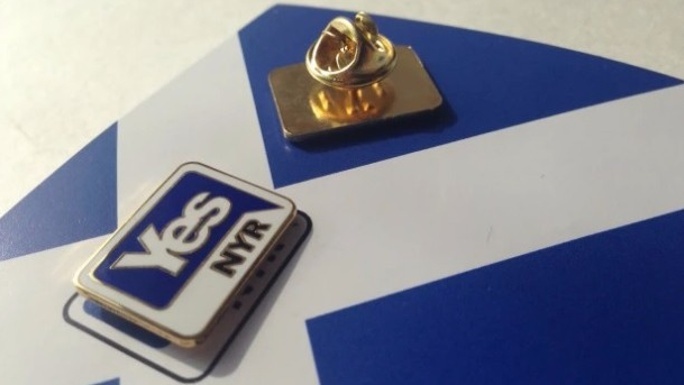 Real Gold (plated ;-), white and blue enamelled NYR Yes badge. Dead Classy and looks great on any outfit! What a lovely Big thing! A multicoloured badge of the world famous Indy App icon. Declare your grass-root class and have your smart phone match your smart lapel. BLING!